Waukesha, WI – March 11, 2014—Waukesha based Odyne Systems, LLC, a leading manufacturer of hybrid systems for medium and heavy duty work trucks and winner of the NTEA 2013 Green Truck Award, will be showcasing its advanced hybrid propulsion system at EUFMC in Williamsburg, VA June 1-4. The company will spotlight one of the first trucks being delivered as part of a $45.4 million U.S. Department of Energy (DOE) award for over 120 Odyne hybrid system equipped trucks. Attendees will have an opportunity to hear the quiet system and learn about the significant emission reduction and fuel savings of these vehicles. transmissions and uses a rugged Remy electric motor in parallel with the existing drivetrain to provide launch assist and regenerative braking. At the job site, the Odyne hybrid plug-in battery system, featuring Johnson Controls’ lithium-ion battery packs, powers typical work site applications with the engine off for a significantly longer time than other commercially available large truck hybrid systems. Odyne systems are modular and can be applied and retrofitted to a wide range of work truck chassis in various applications. The systems are sold and serviced through a worldwide distribution network including Altec, DUECO and Terex Utilities. Odyne has also authorized selected Allison Transmission Distributors to service Odyne Systems across North America. Odyne is a leader in hybrid drive systems for medium and heavy-duty vehicles. Odyne’s advanced plug-in hybrid technology enables trucks over 14,000 pounds to have substantially lower fuel consumption, lower emissions, improved performance, quieter job site operation and reduced operating and maintenance costs. 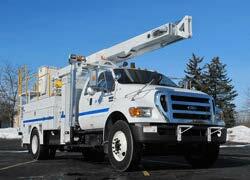 Odyne has fielded more plug-in hybrid trucks to fleets throughout the United States than any other supplier. The name Odyne represents the combination of “O” for Optimal and “dyne” for Force. The company sells its unique modular hybrid system for new and retrofit applications direct to truck manufacturers and through a global distribution and service network. For further information, visit us at www.odyne.com and follow us on Twitter @Odyne. Allison Transmission (NYSE: ALSN) is the world’s largest manufacturer of fully automatic transmissions for medium- and heavy-duty commercial vehicles and hybrid-propulsion systems for city buses. Allison transmissions are used in a variety of applications including refuse, construction, fire, distribution, bus, motorhomes, defense and energy. Founded in 1915, the company is headquartered in Indianapolis, Indiana, USA and employs approximately 2,700 people worldwide. With a market presence in more than 80 countries, Allison has regional headquarters in the Netherlands, China and Brazil with manufacturing facilities in the U.S., Hungary and India. Allison also has approximately 1,400 independent distributor and dealer locations worldwide. For more information, visit allisontransmission.com.